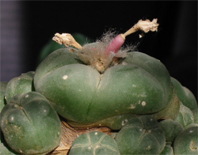 Today the oldest cactus in my collection (a Lophophora williamsii named Nestor;-) flowered for the first time this year. 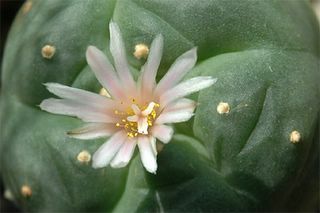 I bought it in 1992 as a small plant in a flower shop, i.e. I don’t know the exact age of the plant nor do I have any locality information (except that it probably originates from a commercial Dutch grower ;-). 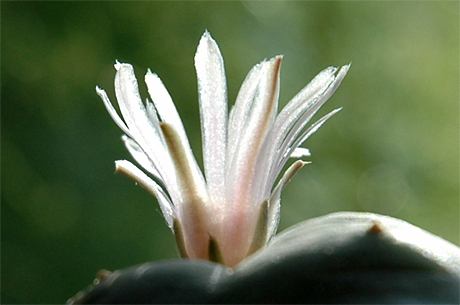 The photo of the backlit flower doesn’t do full justice to the sight – the sunlit flower has an almost mother-of-pearl sheen to it.